More dial-a-ride transit service is now available in the City of Lincoln! Adding 150 additional service hours means there are more buses running throughout the day to take people where and when they want to go in the City of Lincoln. How did this improvement come about? Well, the annual Unmet Transit Needs process is a rigorous outreach effort that PCTPA and local jurisdictions conduct to better understand how the area transit systems are working for Placer County Residents. 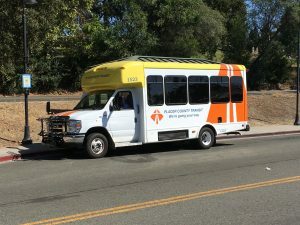 One of the things PCTPA and the City of Lincoln discovered is that there is a need for more dial-a-ride transit service in the city during the morning hours. Weekday ridership increased by 16% and dial-a-ride buses are now experiencing limitations on the number of trips they can provide. In response to these findings, the City of Lincoln will enhance Dial-a-Ride service by adding 150 hours of service a year that coincides with the Lincoln School Tripper, effective immediately. “By reaching out to Placer County residents through a series of public workshops and an online questionnaire, we were able to collect information about how well our existing transit system is working for the community,” says Aaron Hoyt, Senior Planner at PCTPA. As a part of the annual assessment, PCTPA works with local jurisdictions to conduct an Unmet Transit Needs study where they examine Placer County’s transit needs that are not currently being met through the existing system of public transportation. “Every year, we ask the community what they believe is missing from the transportation system and in response, we look at what transit needs are reasonable to meet and appropriately administer the Transportation Develop Act (TDA) funds,” says Hoyt. “This is just one way we stay attuned and responsive to community transit needs.” Concurrently, PCTPA is embarking on their Short Range Transit Plans update and as a result of enhanced outreach effort, this year’s Unmet Transit Needs process resulted in a 53% increase in the number of comments received. Outcomes/Findings from the Unmet Transit Needs Study are paid for through Transportation Development Act funds (TDA), which is the primary funding source for most transit systems. The process requires PCTPA to determine which transit needs are reasonable to meet, but to also ensure TDA funds are spent appropriately. partnership that would lead to more mobility options for Placer residents. The study was presented to the PCTPA Board of Directors for acceptance on February 28th. While the Unmet Transit Study questionnaire is closed, PCTPA conducts their Unmet Transit Needs study annually. Be sure to stay tuned to news about PCTPA transit studies through the website at http://pctpa.net/transit-planning/.